In the General Chapter of Bologna held earlier this year, Dominican Provincials from around the world gathered. At the end of the Chapter they write the “Acts of the Chapter.” Some exciting news comes in the Prologue to the Acts! How will we, members of lay Dominican communities prepare for the challenge? Will we accept the mission? 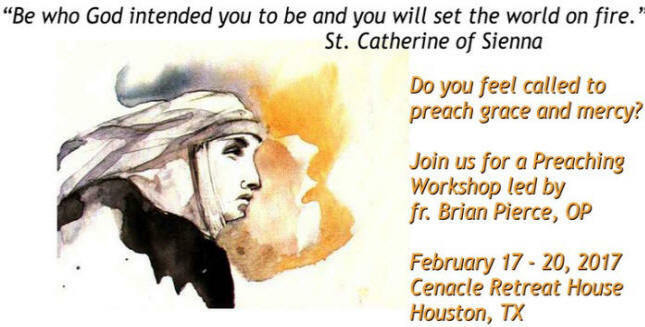 You are invited to gather in Houston, Texas for a preaching workshop for lay people, February 17-20, 2017. See your letter of invitation from fr Brian J Pierce, OP, Promoter of the Laity in the Southern Province in this issue of Luminaria. Get your Bible! We will meet on the road to Houston! Only 10 spots remaining – sign up today. The cost for the workshop is $275 which includes lodging, all meals, and all retreat materials. A deposit of $100 is required to reserve your spot with the balance of $175 due by November 10th. Click on an announcement title below that you would like to read.